The Wirrn are one of the more fascinating creatures in Doctor Who mythology, borrowing from the reproductive means of many insects on Earth and laying their eggs in other species with larvae that then eat their way out of the host. Sadly, the lower budget allocated the programme during their introduction in ‘The Ark in Space’ failed to realize their full potential and somewhat hampered their menace. However, free from budgetary costume constraints and following a successful repeat appearance in The Eighth Doctor Adventures tale ‘Wirrn Dawn,’ Big Finish brings the insects into its main range to confront the Sixth Doctor and new companion, Flip. ‘Wirrn Isle’ covers a lot of very depressing territory during its running time while still maintaining a sense of the indomitable human spirit. As the Buchman family tries to re-establish a failed human colony on what was once Loch Lomond and struggles to cope with accordant loss, fear, and cynicism, they soon find themselves besieged by a group of frozen Wirrn that is slowly beginning to awake. Yet as the story unfolds, a much deeper emotional layer that explains their actions adds an incredible amount of depth to what otherwise would be a fairly straightforward story of isolation and horror. In fact, the story changes from a rather measured story of Buchman secrets to one of Wirrn action partway through, and experiencing the Wirrn using the transmat to capture Nirva City and then greater portions of the world is sure to appease long-time fans, and their exploitation of the sympathetic agonies of the Buchman family works to incredible effect. The Wirrn themselves are also discussed in much greater detail than in any previous story, and the complications arising from these revelations are extreme enough to completely alter the Doctor’s usual course of action, resulting in an uneasy resolution that is tenuous at best. The only major downfall of ‘Wirrn Isle’ is that it relies on human dialogue to truly emphasize the realization of the threat that the very rational and dangerous Wirrn possess. The body count is quite high by the story’s end and the insects prove adept at playing on human emotions to succeed in their aims, but the actual invasion never seems like a truly active part of the plot, instead happening passively through the accounts of others. Still, this horrific foe in conjunction with the terrors that humanity’s own fears and emotions can cause help to create a very harrowing story from beginning to end. 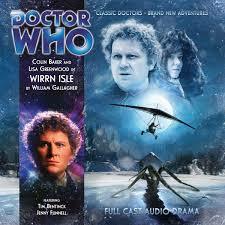 Big Finish rarely attempts to deliver a story with such incredible emotional impact, but ‘Wirrn Isle’ is undoubtedly a success in that regard, giving new depth to an old enemy and handling the depths of humanity wonderfully. At the end of this first set of three stories with Flip as the companion, Big Finish still seems unsure of exactly how they want to write this character; though she’s incredibly practical and compassionate, her unabashed enthusiasm still seems just a little out of place, and it takes away from the argumentative spark that so fuels the Sixth Doctor and his best companions. Still, there are plenty of opportunities to further refine this character, and Colin Baker and Lisa Greenwood certainly have the chemistry to make it a lasting companionship should Big Finish give it a chance, here anchoring what is altogether another unqualified success.